eSnipe gives you the power to effectively manage and win eBay auctions by placing bids for you during the last few seconds of an auction - a practice commonly known as "sniping." With eSnipe bidding for you, you can mask your interest in an item, protect your privacy, change or cancel bids, and more. eSnipe keeps you out of bidding wars. In a traditional or outcall auction, it's good practice to set a price and stick to it. But those auctions last only a minute or two. If you set your price early on eBay, other buyers have up to 10 days to outbid you. These bidding wars can be sharply reduced by holding your bid until just a few seconds before the end of the auction. They won't have a chance to outbid you! 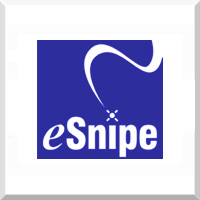 For auctions won in US dollars, eSnipe charges a fee of approximately 1% per auction win. It's $.25 for items under $25 and capped at $10 for items over $1,000. More Information for: eSnipe.com, Inc.